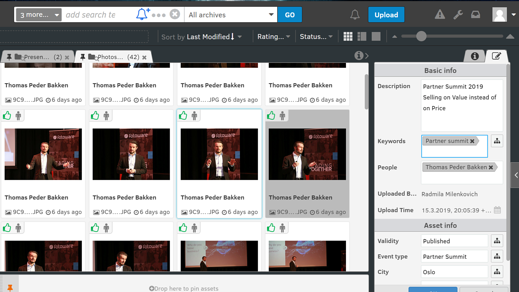 Have you organized an event recently where, post-event, you had thousands of photos to contend with? You don't want to leave them lying on the "bottom shelf", even if that means storing them safely on a hard drive. So, how can you manage such large collections and make sure they're culled and sorted effectively, and how can you make the finished collection available to stakeholders involved in managing your brand? Start as soon as possible after the event - Set aside a dedicated time to go through the photos will save your project. Your photos are most relevant right after the event, so strike while the iron is hot! Define a plan - How do you plan to use the photos? Start with your audience in mind. Granted, you really should be thinking about this before you go out on a photoshoot in the first place. Make a selection - Don't dump all the photos into a common sharing-platform indiscriminately. Your coworkers won't have the time to go through thousands of photos when all they're looking for is that single, good shot. 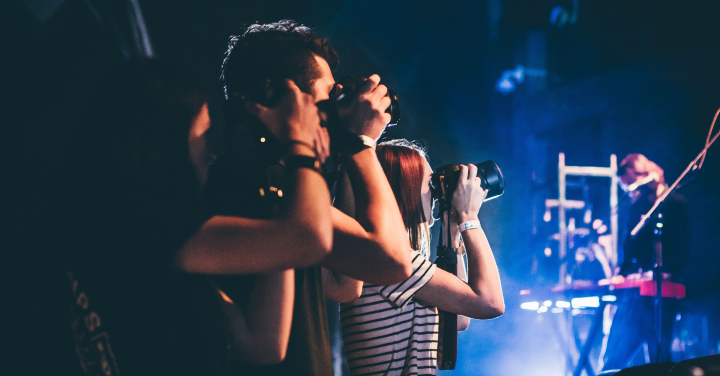 If you've been tasked with curating photos from the event, you should do just that. Remember that others won't see the photos you choose not to include in the final set. Make sure photos are searchable - Tagging the photos with sufficient, relevant metadata gives them a longer lifespan. It also guides users that are looking for a particular shot that's suitable for their planned use. Additional tip: Tag the people in the photo! If or when necessary, you will be able to easily delete personal information (which includes photos) on request , which is an important step towards GDPR compliance. Invite all event attendees to see the final collection! Though they may not find a picture of themselves in the curated collection, they may be interested in sharing good photos on social media to create awareness about your brand. FotoWare organized a Partner Summit earlier this month, where FotoWare's resellers and system integrators from 14 different countries visited our home city of Oslo, Norway, for a three-day conference. During those three days, a single photographer took no less than 4000 pictures. 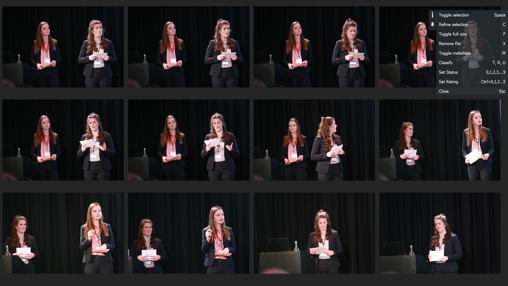 In no time, we had shared with our conference visitors (1) all speaker presentations, (2) ready-edited footage and (3) a selection of the 200 best pictures from the event. After the event, I received all the photographer's RAW photos on an external drive. Using our FotoStation image management workstation, I was able to reduce the initial 2000 pictures to a much more manageable 200 in less than an hour. FotoStation accessed the drive (SD card) with the photos - it can browse the memory card directly without having to import the pictures first. I classified and sorted all pictures by opening 12 photos at a time in a compare view and used keyboard shortcuts to tag the files - 't' for tagged, meaning I would keep it and 'r' for rejected. 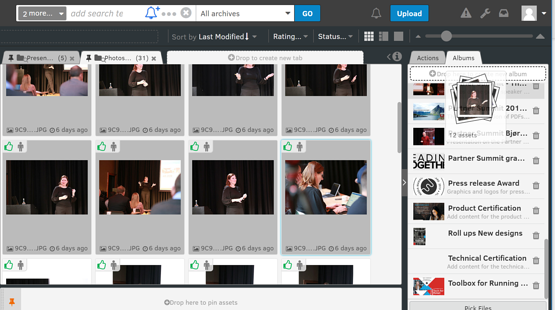 In this way, I could ensure that I had the best photos from each speaker and session, whilst ensuring nothing was deleted. After isolating the tagged pictures that I wanted to keep, I enhanced the photos - I applied a SmartColor enhancement filter to the photos. SmartColor is a natural color enhancement filter that improves the color balance in the image to become more pleasing to the eye. I uploaded all photos to FotoWare straight from FotoStation in a matter of seconds. All photos needed to be tagged with additional metadata, so that all my colleagues could find them and start using them straight away in social media. Using the FotoWare web UI, I could access the area where the pictures had been uploaded and make selections using the mouse or the keyboard, or a combination of both. File information and metadata matters. I used the information panel in FotoWare Pro to see the metadata that had been added to files at this point. I could now choose multiple files to compare and edit the metadata values of all selected assets in the editor. This way I could, for example, add or remove keywords, unify the content of fields that have different values at the outset, or simply add new content that should be applied to the entire selection of assets. This ability to work with whole batches of files really is indispensable when you've got a big volume of photos to deal with. Sharing files. Having added the necessary metadata to all files, I wanted to share the collection with coworkers, partners and guest speakers. I quickly added the entire selection to an album, and I even made individual albums for each external, professional speaker that included only their photos. An email is automatically sent out to invited ones, and shortly after we received the first notifications that our pictures had been shared on social media. Why is metadata key in large collections? As you can see, it helps you to quickly tag and organize your content. Using basic tagging to approve and reject assets at the outset can help you to focus on the good shots that you want to keep. From there on, you can make each file searchable by adding descriptive keywords for things such as objects, people and more, and technical keywords that indicate purpose, location, timing and other useful data. Do you want to learn more about working effectively with large collections of files? You can also streamline workflows, creating custom workflows to process and optimize your selections. FotoWare comes with a 30-day free trial, with no strings attached and no credit card required.